Some have commented that, according to this blog, we appear to rarely work. Update after update shows us lounging, sipping cool drinks under cabanas or something like that. 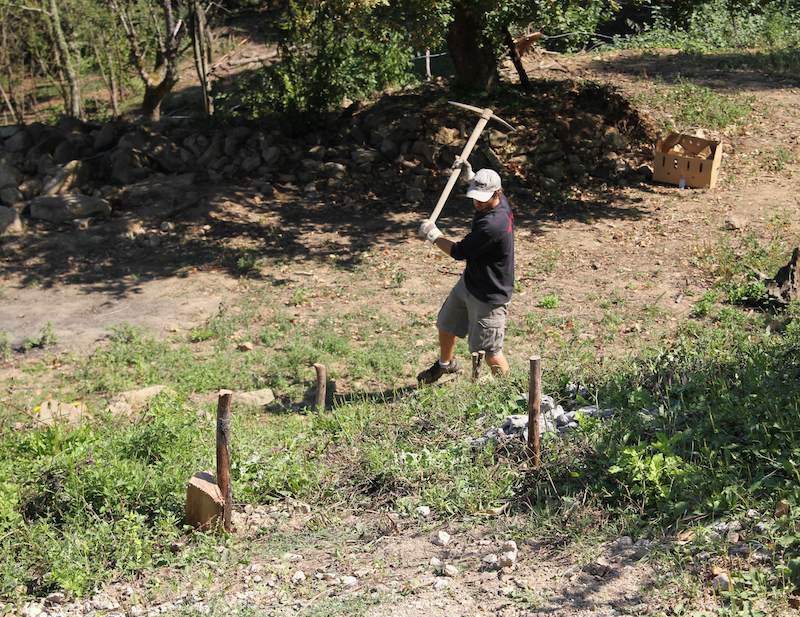 So, in response, here is a photo of what I was doing this morning: smacking a pick axe into stone-chocked hillside. I’m helping build and install a stone staircase. I started by sinking those four vertical stakes, which now hold the guide lines that dictate the boundaries of the stairs. About time you did something productive. This is one day I am NOT totally jealous. Is it a stairway to heaven? We can’t see your face, so how do we know it is actually you? That could be some Italian guy working while you’re drinking wine and eating pasta.